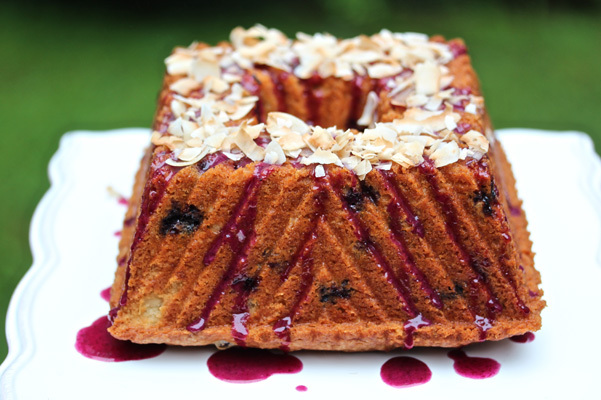 This Blueberry Coconut Bundt Cake is the second cake I made in my new Bundt Squared Pan. (Check out the Brown Sugar Pecan Cake with Caramelized Nectarines for another take on this great new piece of equipment). Simple cakes made in decorative pans have been my thing recently ever since I taped a CRAFTSY class – Coffee Shop Cakes: Good to The Last Crumb – featuring all kinds of pound cakes and Bundt cakes. This cake was inspired by two things: the shape of the pan and the idea of a purple colored glaze made with mashed fruit and no food coloring. 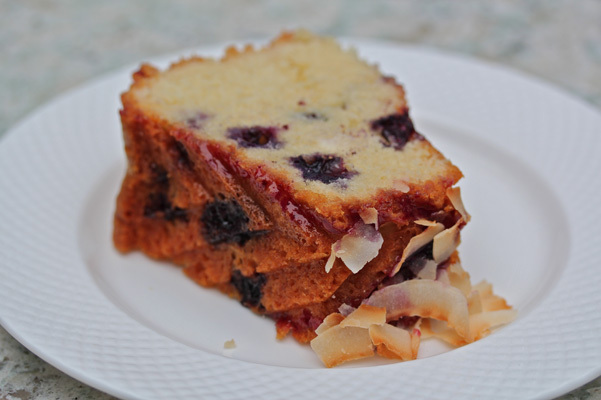 The coconut flakes add texture and flavor that complements but does not overshadow the fact that this is a blueberry cake. Make sure to use unsweetened, large coconut flakes for best result. Position rack in center of oven. Preheat oven to 350°F degrees F. Coat the inside of a 10-cup ring or Bundt pan, such as the Nordic Ware Bundt Squared Pan, thoroughly with baking spray (that contains fat and flour). Make sure to coat every nook and cranny. Whisk together the flour, baking powder and salt to aerate and combine. In a large bowl, cream the butter with an electric mixer until very light and creamy. Add the sugar and continue to beat until light and fluffy, about 3 minutes. Beat in vanilla. Beat in eggs one at a time, allowing each to become incorporated before adding the next. Lightly beat in flour mixture just until incorporated. Fold in blueberries and ¾ cup of the coconut flakes. Scrape into prepared pan. Smooth top with a small offset spatula then tap bottom of pan firmly on counter to dislodge any large air bubbles. Place remaining ¼ cup of coconut flakes in a cake pan or other small bake-proof dish. Place cake and coconut flakes in oven. Check coconut after 5 minutes; just bake until very lightly golden brown. Cool. Bake cake for about 50 to 60 minutes or until golden brown and a toothpick inserted into the center of the cake comes out with a few moist crumbs clinging. Let cool in pan for 10 to 15 minutes, then turn out onto a wire rack and cool completely. Cake is ready to serve or make glaze. Once the cake is cool make the glaze: Place blueberries and sugar in a small nonstick sauté pan or pot. Cook over medium heat while mashing fruit with the broad side of a silicone spatula to release juice. Keep cooking and mashing until rich purple in color and syrupy, about 2 minutes. Press through a strainer into a small mixing bowl. Discard solids. Add sifted confectioners’ sugar to bowl and begin to stir. Only add enough water to make it fluid, but still thick. Use a spoon to drizzle on cake, allowing the glaze to drip down the pretty ridges. Sprinkle with toasted coconut while glaze is still wet. Cake is ready to serve or may be stored under a cake dome at room temperature for up to 3 days.